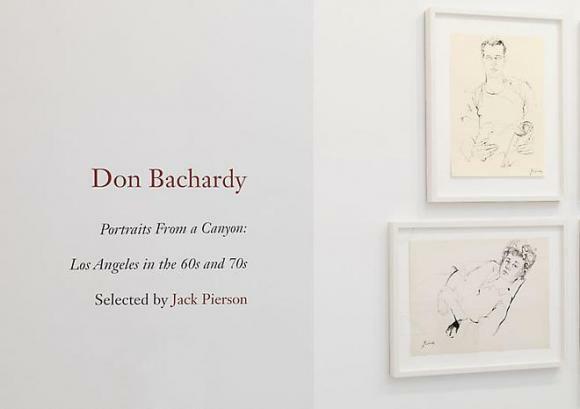 Cheim & Read is pleased to announce an exhibition of a suite of drawings by Don Bachardy: Portraits From a Canyon: Los Angeles in the 60s and 70s. The show was selected by Jack Pierson. Born in Los Angeles in 1934, Don Bachardy attended UCLA, the Chouinard Art Institute, Los Angeles and the Slade School of Art, London. In 1952, at age 18, he met and fell in love with novelist Christopher Isherwood. Despite a 30-year age difference and cultural prejudices of the time, the two maintained a devoted relationship until Isherwood’s death in 1986. A well-respected, prominent figure in the Hollywood scene, Isherwood introduced the young Bachardy to a talented circle of bohemian artists and writers. With Isherwood’s encouragement, Bachardy pursued his art degree and soon became established in his own right, taking the lively group as his subject. He had his first one-man show in 1961 in London. The mid-60s to 70s subsequently proved to be a particularly productive time, as evidenced by the drawings in this exhibition. By capturing the essence of his subjects, Bachardy conveys the spirit of the time and place in which they were made. The hair, clothes and postures depicted are certainly emblematic of 1960s and 70s L.A., but it is Bachardy’s unique ability to render his sitter’s distinctive presence that is most evocative of the period. The portraits selected for this show are a remarkable collection– among them Warren Beatty and Richard Deacon, Natalie Wood, Jane Fonda, and Katherine Hepburn, Joan Crawford and a youthful Elton John, artist Ed Ruscha and writers Joan Didion, Anaïs Nin, and James Baldwin. However famous his subject, Bachardy was, and remains, egalitarian in his approach. He did not seek out celebrities, but rather drew those who were disciplined enough to sit, virtually unmoving, for several hours. Modesty dictated a common approach: all sat in the same place in his studio, with a view of the Pacific. Bachardy completes his portraits in one sitting, thus retaining the immediacy of his approach; he works quietly and precisely, rendering little extraneous information. When describing the process of selecting work for the show, Jack Pierson commented upon the effects of Bachardy’s concentration: individual lines, drawn with obvious freedom and speed, are remarkably abstract close-up, but coalesce, almost magically, to a unique but realistic likeness. Pierson also noted the variety of mark-making in a single drawing – Bachardy uses the full range of his materials, from the ethereal silver of graphite to the dense black staccato of India ink. Areas of intense focus – the hair, face and gaze – are contrasted by the minimal description of a sleeve or shoulder, as if over-exposed. Drenched in light, the sitter seems to materialize before our eyes. Bachardy’s process parallels that of David Hockney, a good friend, and anticipates Elizabeth Peyton‘s fine-lined portraits. Most strikingly, Bachardy’s images convey a profound sense of intimacy and introspection. The familiarity of his working method is heightened by an unspoken tension between artist and subject. His careful scrutiny led one sitter to declare her love for him, and another to comment on the many times he looked up while drawing, as if his pencil was a fluid extension of his eye. Bachardy asks his sitters to sign the drawings with him, confirming the collaborative aspect of his process. Ultimately, the viewer collaborates too: in looking at the portraits, one reactivates the initial exchange, meeting the gaze of a past era. Bachardy lives and works in Santa Monica, California. His work is in the collection of the Metropolitan Museum of Art, New York; the de Young Museum, San Francisco, the Fogg Art Museum of Harvard University; and the National Portrait Gallery, London, among others.